Last night I tried out a new pomegranate chicken recipe. I based it on a recipe I found on Crockpot365.com I tweeked it a bit. I used chicken instead of beef and I used regular diced tomatoes. It was pretty dang good, but the potatoes I paired it with really stole the show. I found this recipe in one of my Gooseberry Patch books (they're seriously the best!). 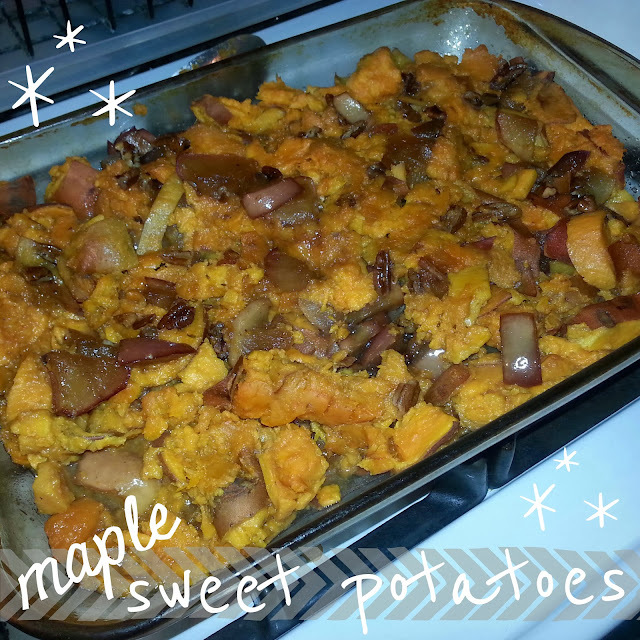 Its simple to make and helped me use up some of my sweet potatoes I got in a hostess pack from Bountiful Baskets in December. Simmer vanilla and maple syrup in a large sauce pan for 5 minutes. Add butter, apples, and pecans. Cook until apples are cooked through. Remove apples and nuts from sauce. Layer potatoes and apples with nuts in a greased 13x9 casserole dish. Pour sauce over potato mixture. Bake @ 350 for 15 minutes. Hope you make something yummy for your family tonight! Ohhh these sound so good! All that maple syrup, apples and pecans with the sweet potatoes?!!! Sounds so delicious!!!! Yum! This looks incredible. Thanks for sharing! !